Get out the Crayolas with no apologies! A report in this week’s Huffington Post on coloring as a great stress-buster for adults is making a splash on Facebook and other media outlets. It seems coloring—for adults—is all the rage in Europe, and just starting to be trendy in the U.S.
Well, ha! We’re on the cutting edge! Oh, and my personal permission to buy a GIANT box of Crayolas with NO SHAME! Just tell ’em I made you do it. 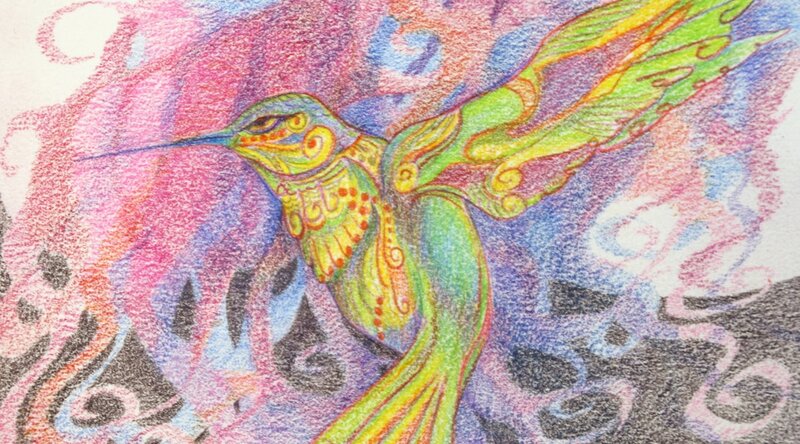 Hummingbirds colored with colored pencils. If coloring in someone else’s design isn’t your thing, how about making “magic rainbow-line” drawings? Remember this from kindergarten? Take a line drawing, flip it over and scribble all over the back with different colors of crayons or colored pencils. Start with a line drawing. Any line drawing will do. Scribble all over the back with crayons or colored pencils. Then place it scribble-side-down on another piece of paper and trace the drawing, pressing firmly. The color will transfer, leaving a multi-colored line. Place scribble-side-down on another sheet of paper and trace. I sometimes like to color in my my multi-colored line drawing, letting the rainbow-colored outline inspire my colors. But, if you are clever about where you put what colors, you can create some very interesting effects as the traced line changes color. Drawing colored in, using the multicolored line as inspiration. Instead of coloring in a simple outline drawing, as I have here, you might choose instead to traced a more complex pattern. People who have forgotten this little kindergarten trick will wonder how you managed to get your line to change colors. But, you don’t have to make too much of it. It’s the color, the repetitive movement of your hand and the opportunity for your brain to focus on something besides responsibilities and chores for a few minutes that alleviates stress. Oh, and probably that intoxicating crayon aroma!